The main emphasis of the Journal of Cognitive Behavioral Psychotherapies and Research (JCBPR) is on original research in cognitive behavioral psychotherapies. 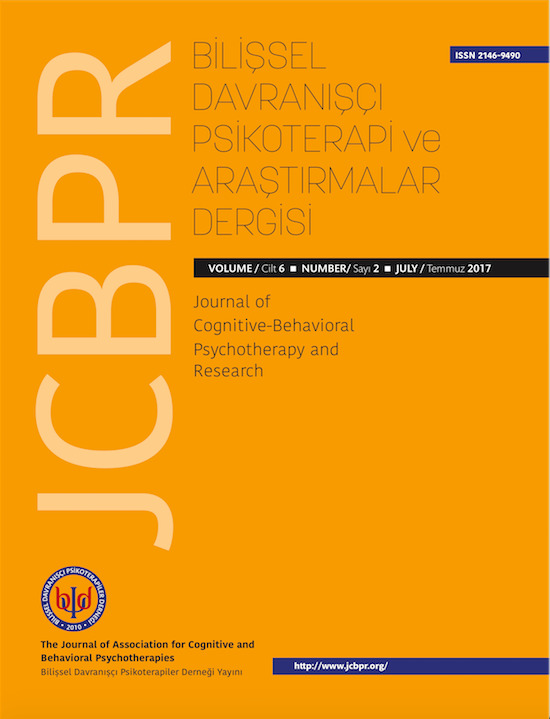 The journal publishes experimental and clinical work conducted in the field of cognitive behavioral therapy. Also, systematic reviews of research, case reports, brief reports, and cognitive behavioral psychotherapy techniques are also considered for publication. Submissions are welcomed from authors in psychiatry, psychology, and other health-related disciplines. Articles that are sent to JCBPR neither should be accepted for publication nor be published by any other journal. However, in papers which have been previously presented at a conference or symposium, this should be stated as a footnote. The editorial and publication processes of the JCBPR are shaped by the guidelines of theInternational Council of Medical Journal Editors (ICMJE). JCBPR is an Open Access journal. nonprofit means that it uses a funding model that does not charge readers or their institutions for access. Readers may freely read, download, copy, distribute, print, search, or link to the full texts of articles. JCBPR does not have article processing charges (APCs) or article submission charges since it is funded by the Association for Cognitive Behavioral Psychotherapies, a nonprofit organization. The publication rights of the articles accepted for publishing are transferred to the journal with the ‘Copyright Transfer Form'. This form should be filled out before the publishing process takes place. If you submit your paper for publication by JCBPR, you agree to have the Open Access license under which you as the author agree that anyone can reuse your article in whole or part for any purpose, for free, even for commercial purposes. Anyone may copy, distribute, or reuse the content as long as the author and original source are properly cited. This facilitates freedom in re-use and also ensures that JCBPR content can be mined without barriers for the needs of research. JCBPR operates a policy of anonymous (double-blind) peer review. We also operate a triage process in which submissions that are out of scope or otherwise inappropriate will be rejected by the editors without external peer review to avoid unnecessary delays. All submissions are screened by a similarity detection software (iThenticate or else). The corresponding author must submit the Authorship Declaration Form on behalf of all the authors. Contributions must be typed in double spacing with wide margins. Manuscripts should be preceded by a title page which includes a full list of authors and their affiliations, as well as the corresponding author's contact details. Author name and address should be excluded from the uploaded article file. The main document must be anonymous. Please do not mention the authors’ names or affiliations (including in the Method section). First, two pages of the article should include the abstracts written both in Turkish and English. Both abstracts should start with the article title in two languages and end with 3 to 6 keywords chosen according to Index Medicus. Turkish keywords must be the exact correspondence of the English keywords. For keyword check, Index Medicus can be reached at the NLB MESH Browser (http://www.nlm.nih.gov/mesh/mbinfo.html). Turkish correspondents of the English keyword can be checked out through http://www.bilimterimleri.com. Page numbers should start after the abstract pages. RESEARCH ARTICLES: Articles that are specifically conducted in the Cognitive Behavioral Therapy area and that are formulated according to the scientific rules and methodology will be accepted for publication. Research articles should be less than 3000 words. REVIEW ARTICLES: Articles that review and discuss the novel information on Cognitive Behavioral Therapy in a comprehensive manner will be included in this section. Review articles should not exceed 5000 words. If a review article is invited, a few coauthors are permitted, but we expect the first author to be the person invited to write the paper. CASE PRESENTATIONS: Cases that were treated with Cognitive Behavioral Therapy methods will be published in this section including the therapy procedures. Case presentations should be less than 1500 words. LETTERS TO THE EDITOR: In this section letters sent on the topics of JCBPR that could contribute to the development of a discussion forum will be published. Letter to editors should not exceed 1000 words. BOOK, THESIS, WEBSITE, AND JOURNAL INTRODUCTION: Articles that introduce and criticize books, thesis, journals and web-based resources will be included in this section. Articles in this section should be less than 500 words. Tables should be typed in double spacing, each on a separate page with a self-explanatory title. Tables should be comprehensible without reference to the text. They should be placed at the end of the manuscript, but they must be mentioned in the text. Figures can be included at the end of the document or attached as separate files, carefully labeled in initial capital/lower case lettering with symbols in a form consistent with text use. Unnecessary background patterns, lines and shading should be avoided. Captions should be listed on a separate sheet. The resolution of digital images must be at least 300 dpi. All figures must be mentioned in the text. All articles should be preceded by two Abstracts (one in Turkish and one in English) of between 150 and 250 words, unstructured (without using any subtitles in the abstracts), giving a concise statement of the intention, results or conclusions of the article. Abstracts should not exceed 250 words in total. In addition, all manuscripts written in Turkish should contain an extra section: Extended English Abstract. An extended abstract is a short section where the research is presented concisely. The purpose of an extended abstract is to share opinions and conclusions in a way that is simply available to the readers/audience. The extended abstract must include all relevant perspectives and information expected in a research paper without being too detailed. Extended English Abstract should be structured (introduction, method, results, discussion) and should not exceed 1000 words. In the “method” section of the manuscript concerned with experimental research on humans or animals, a sentence showing that the informed consent of the patients or volunteers has been obtained following a detailed explanation of the interventions carried out on them. In such studies, author(s) should clearly state the compliance with international guidelines such as “Declaration of Helsinki” and “The Guide for the Care and Use of Laboratory Animals”. In experimental animal studies, ethical considerations within “The Guide for the Care and Use of Laboratory Animals” should be followed. Moreover, the author(s) must comply with “Regulation on Medical Research” issued by the Republic of Turkey Ministry of Health and published in the Official Journal dated 29 January 1993 and numbered 21480; and more recently published rules laid out in government ethics rules. They should forward a copy of the Ethics Committee Approval received from the relevant institution. JCBPR uses a reference system based on the American Psychological Association’s format (6th edition) for reference citations. All manuscripts submitted to JCBPR should be written and formatted according to the APA Style (6th edition) as specified by the Publication Manual of the American Psychological Association, 6th Edition. Please, go to web address above to have a look at the sample paper. A Work by 3-5 Authors: List all the authors in the signal phrase or in parentheses the first time you cite the source. Use the word "and" between the authors' names within the text and use the ampersand in the parentheses. 6 or More Authors: Use the first author's name followed by et al. in the signal phrase or in parentheses. References should be arranged first alphabetically and then further sorted chronologically if necessary. More than one reference from the same author(s) in the same year must be identified by the letters 'a', 'b', 'c', etc., placed after the year of publication. MS Word users can select the references with cursor, then go to paragraph settings by right clicking, and select “hanging” option in the special column for easy formatting. Beck, A. T. (1967). Depression: Clinical, experimental, and theoretical aspects: University of Pennsylvania Press. Bersani, C. A., & Chen, H.-T. (1988). Sociological Perspectives in Family Violence. In V. Hasselt, R. Morrison, A. Bellack, & M. Hersen (Eds. ), Handbook of Family Violence (pp. 57-86): Springer US.